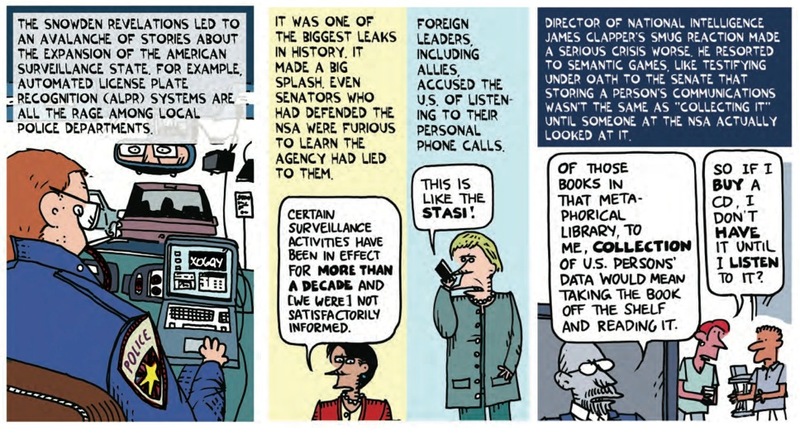 Ted Rall has been writing and drawing political comics and journalism for decades now. He has written critically about all stripes of politicians and leaders, including George W. Bush (Generallisimo El Busho) and Barak Obama (The Book of Obama). He has been an imbedded journalist in Afghanistan and a political cartoonist for a number of high profile publications, including the Los Angeles Times (who seem to have unjustly fired him). Rall's work can be something of an acquired taste, and he is infamous for his art style, which may generously be called primitive or raw but some find ugly or even incompetent. He also has a reputation for being a contrarian and gets into feuds (most famously a legal one with Danny Hellman). Whatever one feels about him politically or personally, I feel his work is an important counterpoint to much of the political rhetoric of our day. With Snowden, I feel he has crafted a compelling book well worthy of attention. This biography of Edward Snowden begins with his childhood and moves through his childhood as a boy scout to his adulthood when he worked as a computer professional before working for the CIA and the NSA. Seeing what he felt was a corrupt system of surveillance and erosion of personal freedoms, he copied confidential files and leaked them to media sources. He became persona non grata in the United States and has since sought asylum in multiple places, most recently Russia. Very recently, the European Union voted not to extradite him to the US, so his status might finally change. Not only does this book chronicle his deeds in heroic fashion, it also tries to situate them in the current context. Rall likens what is happening in terms of government to a devolution of society into the dystopian police state of 1984. Clearly, this is a provocative book that wears its politics on its sleeve, and it pulls no punches. Rall provides plenty of references and footnotes to back up his thoughts and observations throughout the book. I feel it is a book that could be used with high school government or social studies classes for sure, and it will also be of interest to anyone who lives in the US, if even to get a view about some very serious matters that may be obscured by biased news coverage. It seems to me that a big part of this book is to flesh out Snowden's personality in contrast to the portrait currently painted in the US media. 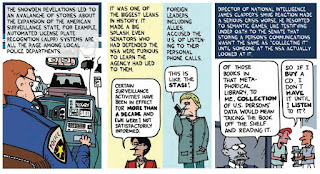 Rall explains more about why he chose to write Snowden in this article. Most of the reviews I have read about this book have been positive. Jordan Minor called it "an entertaining, exhaustive, and approachable look at an incredibly important and relevant topic." 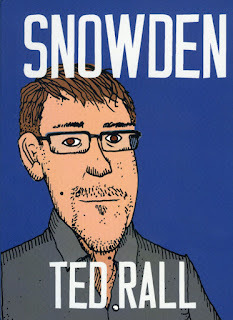 Henry Chamberlain wrote that Rall lends a sense of warmth to Snowden, which makes this book "a most compelling read." James Helmsworth was more critical of the book's claims that we are living in a 1984 world but still concluded that it was "a fitting and functional portrait." Snowden was published by Seven Stories Press, who have more information about it here. Thank you for the review copy! Today, I am going to check in with the latest entries in a couple of promising series to see how they are progressing and if they are living up to the great expectations I had reading the first volumes. I think both series feature examples of exceptional world-building and strong character work. 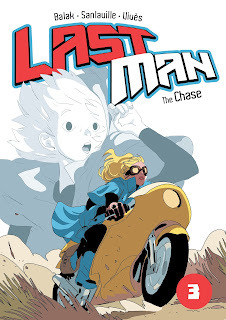 The Chase is the third book in the Last Man series (my first two reviews are here), what has so far been a tale set in a small fictional town, focusing on a fighting tournament. All of those provincial matters from the Valley of the Kings get left way behind here. Mom Marianne has taken her son Adrian out of town to track down his former fighting partner, the scalawag Richard Aldana, who has skipped town with the trophy. Amazingly, she has a badass motorcycle, a map to strange lands, and hitherto unknown ability to summon powerful spells. The emergence of Marianne's secrets is just one of the surprises this book holds. There are also a massive trek through a wasteland, a battle with corrupt policemen, a surprise rescue from some quite remarkable firemen, a visit to a crazed city, some duck and covering in a brothel, and a trial that is part professional wrestling, part kangaroo court. A lot of the reviews I have read compare it to Mad Max, and there definitely are similar insane energy and situations at play here. There is so much that goes on that it is sort of hard to believe this is the same series as before, but the action is frenetic and breathtaking. And I continue to be won over by the winning characters. They are so much fun to read about and see in action. The artwork is as excellent and expressive as ever, a great mix of European and manga comics conventions. I have not been able to find many reviews of it as of yet, but the ones I have read have been positive. Matthew Garcia called it "engrossing, gripping, and a lot of fun." Comic Bastards called it "another really impressive addition to the Last Man series and a bright spot in the dull year that 2015 has been for comics." A lot of the action in this book is set in a whorehouse and there are a few threats of sexual violence, so I wonder how kid-friendly this book is. 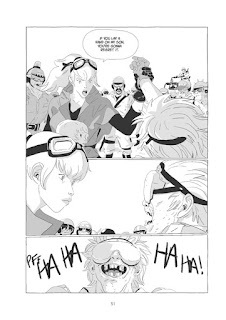 But at the same time I can't help but think that the fast-paced action and broad humor cannot help but win readers over. I'd recommend it for older young adult readers. Verdict: I am still hooked on reading what will happen for two reasons: 1) to see what awesome and insane venues this adventure will lead, and 2) to see what other surprising twists and turns lay out there for these endearing characters. 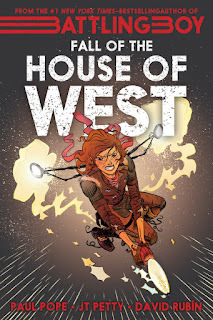 Battling Boy was one of my favorite books of 2013, and I was very impressed by the dark turn and truly scary tone of its follow-up The Rise of Aurora West. Fall of the House of West very much continues in the same vein, and in this book we learn more about the plans and intentions of the monsters. And more importantly we learn the full story about the death of Rosetta West, Aurora's mother. There are a great many revelations in this book, and I have to say that the narrative is very well thought out and quite heartbreaking. It is also quite impressive how all three book's narratives fit together and compliment each other in suspenseful and satisfying manner. I know that many people are down on the fact that Paul Pope is not drawing this book, but I have to say that I don't miss his artwork because David Rubin's artwork is simply stunning. It is simultaneously realistic, cartoonishly animated, and monstrously frightening. 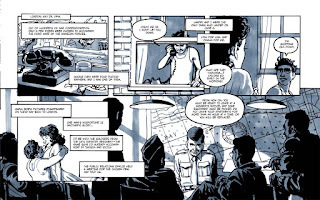 The layouts and storytelling are masterful. He really takes all of the nuances and affordances of sequential and uses them to his advantage here. Even in the smaller paperback format, his art pops and really sells the book. All of the reviews I have read about this book have been strongly praising. Dustin Cabeal impressively called this series "the best superhero stories being told in comics to date. Nothing is even remotely close to being as good." Tobias Carroll concluded simply that it was "a terrific ride." Lindsey Morris summed it up as "Recommended reading for any comics fan." The monsters and family issues in this book are quite horrible and harrowing, so I don't think this book is quite for younger elementary school students, but I think it would be a great for grades 4 and up, especially if they can handle scary stories. Verdict: I am very eager to see what the next follow-up in the Battling Boy series will be. It has been a fantastic series full of action and a surprising amount of heart. Both books were published by First Second. They provide previews and much more information for The Chase here and for Fall of the House of West here. 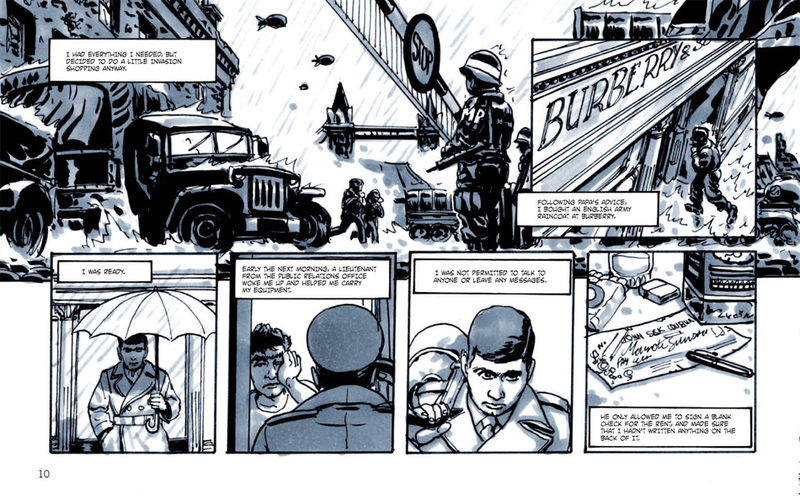 This book is a unique one, an auspicious beginning of a series of books that are part graphic novel, part photo-essays, and part historical commentary about great moments of World War II. 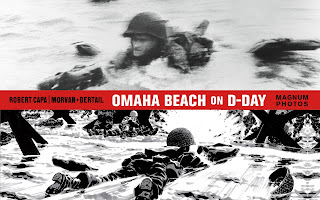 Omaha Beach on D-Day focuses on the life and work of Robert Capa, whose internationally famous photos of the June 6, 1944 battle captured the horror and brutality of war in an intimate way. Amazingly, he lost many of those photos due to wear and tear in the ocean as well as a chemical accident during development, but the ones that survived made quite an impact. Here, we see how he prepared for that day when he bravely rode in with the troops on a seafaring transport. Capa's photos were the inspiration for the opening scene of Saving Private Ryan, and the war sequences in this book are equally harrowing. The rest of the tale depicted here is fascinating, though, and I was very taken with its attention to detail and historicity. Following the comics story is a gallery of his WWII pictures, and following those were a series of articles about Capa's life, career, artistry, and technical take on photography. I found myself fascinated by the entire package, and I love how the whole work coalesced into a pretty complete reading experience. 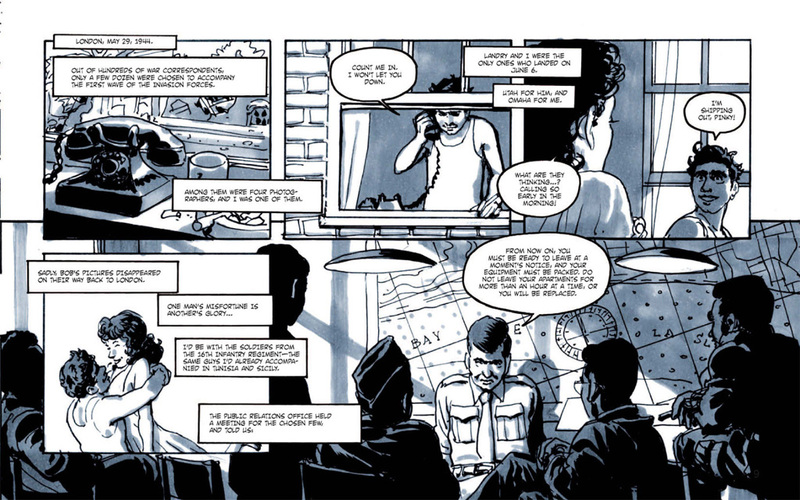 Writers Jean-David Morvan and Séverine Tréfouel collaborated with artist Dominique Bertail to create the comics in this book. 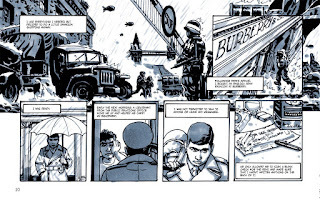 Morvan is an award winning writer for his work on youth comics, and he and Tréfouel also write a comic series called Ocelot. 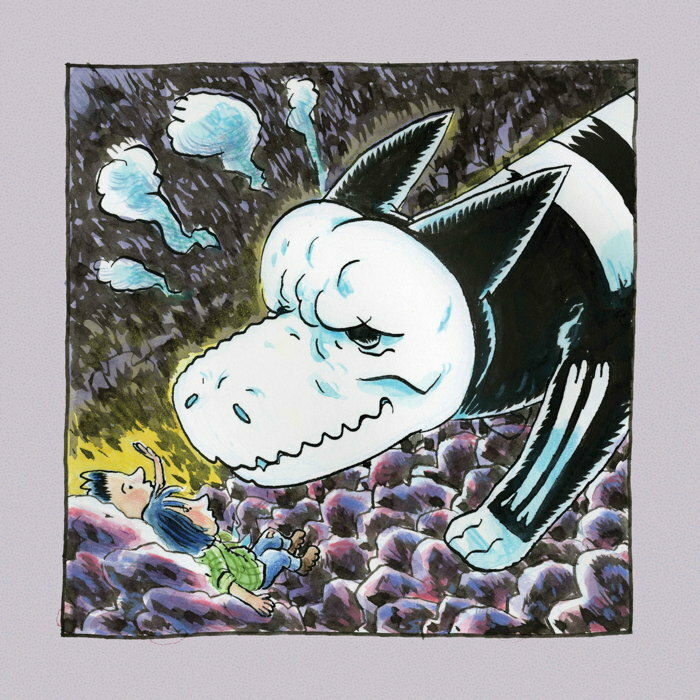 Bertail is a prolific illustrator who has been making comics for two decades. I was not able to find many reviews for this book, but the ones I read were glowing. The reviewer at Coverless Review simply stated that "Writer, Jean-David Morvan and artist Séverine Tréfouel do an amazing job with this book." Kelly Fineman summed up, "This book, through its combined story-telling methodologies, makes these images accessible today in a powerful and gripping way." And I agree with Nick Smith who wrote, "This book will appeal to fans of serious graphic non-fiction, but also to World War II buffs and students of photography." Omaha Beach on D-Day was published by First Second in collaboration with Magnum Photos, and they have a preview and much more available here. Smoke is a small but powerful book. It tells the tale of two small boys who are migrant workers in the tobacco industry.It is troubling to see them relegated to their circumstances, forced to work long, hard hours and not treated as children. They also get exposed to the raw, wet tobacco plants, which has some adverse effects on their health. I don't want to spoil too much, but this situation is radically changed when they are visited by Xolotl, an Aztec god of fire, lightning, and the underworld. This mystical, mythical god looks after the boys and guards them through some tough situations. For a small, seemingly simple-looking book, it packs a pretty big narrative punch. At first blush, I was perplexed by the subject matter. It seems like an expose of child labor horrors, but the story resolves in such a way that all is still well. I guess, what I take away from the beautifully rendered drawings and strong character work is that life is full of suffering and injustice but there is some hope that there are guardians looking out for us still. I am not sure if that is trite or reassuring, but I am glad to have to wrestle with those ideas after reading this book. It shows just how strong this tale is, packed with import and resonating like a modern parable or fable. Author/artist Gregory Benton has been making comics since the early 1990s for a diverse bunch of publishers including Nickelodeon, Vertigo, Entertainment Weekly, Disney, Tower Records, DC Comics, and World War 3 Illustrated. 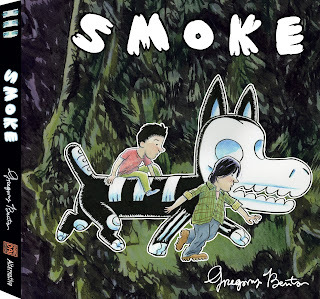 I love his gorgeously colored and detailed paintings, and his prior graphic novel B+F was one of my best of 2014 books. He elaborates on his inspirations and work on Smoke in this interview. I very much enjoyed reading this book, and I found it ever better to re-visit and re-read. I have not been able to locate many reviews of it, but the ones I have found have been very positive. The Pop Mythologist wrote that it "works as both modern myth and social critique." Adam McGovern gushed that it was "among the best things I’ve read this decade." Smoke was published by HANG DAI Editions. 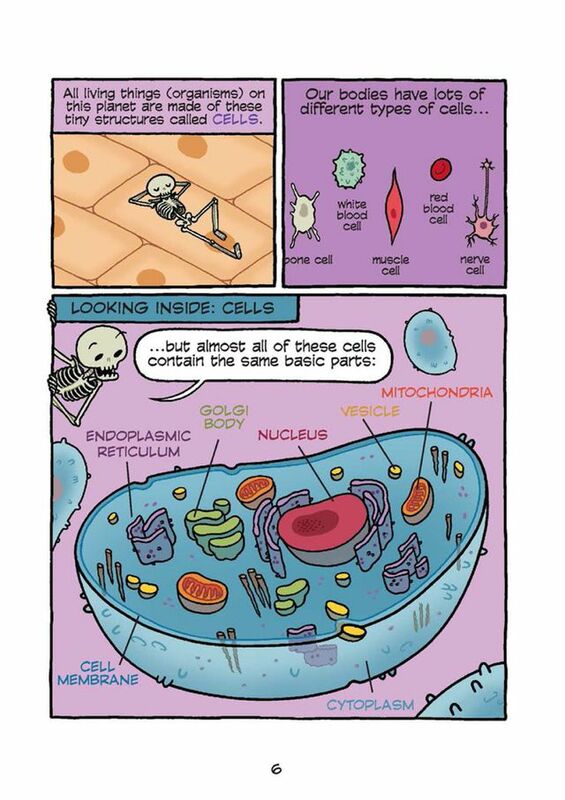 and a catalog of body parts and systems. As you can see from the excerpts, the artwork is clear, detailed, and very well rendered. in addition, I really enjoy the humorous elements of the book. I think it would be very easy for this content to be overly precious or cutesy, but I feel the balance between funny, facts, and grossness helps keep the proceedings from being saccharin. Perhaps the worst thing I can say about this book is that it is ultra-dense with information, and it can be a lot to take at once. 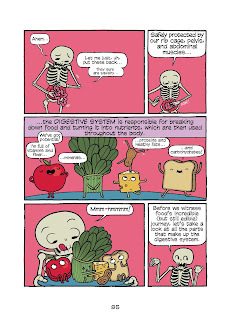 I certainly found it more digestible (ha!) to read in small chunks. Still, I found the humor winning and the content quite compelling and well researched. 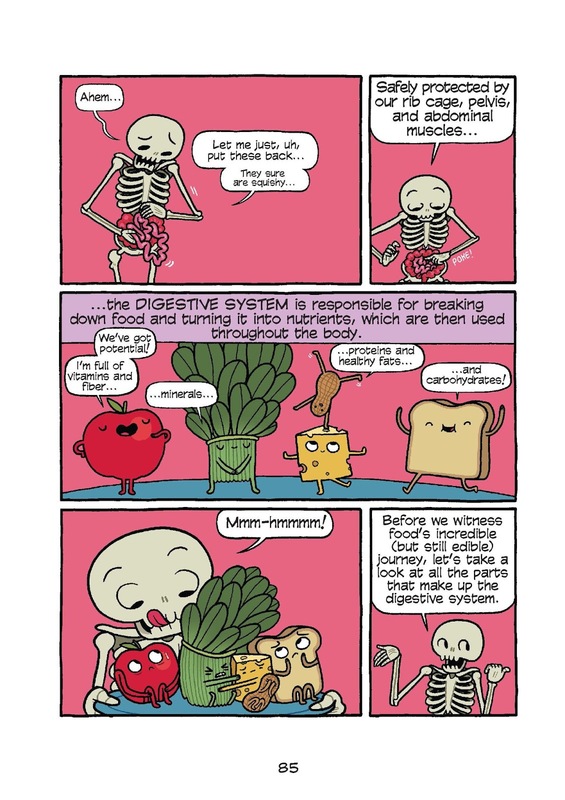 If I were a biology or anatomy teacher, this book would be required reading. 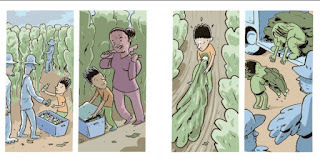 Maris Wicks has drawn one of my favorite graphic novels of 2013, Primates. 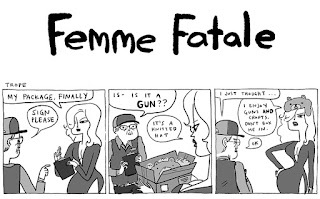 She has also created a number of comics and minicomics, including Yes, Let's. She blogs about her work and also has a tumblr.She talks about the genesis and work on this graphic novel in this interview. All of the reviews I have read of this book have been very positive. 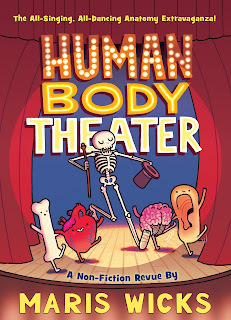 In a starred review for the School Library Journal, Steven Engelfried called it "delightful and enlightening. Publishers Weekly summed up that it was "brilliant adjunct reading for biology students and the terminally curious." Kirkus Reviews called it "a grand show" but also added that "it’s a lot to take in at one sitting." 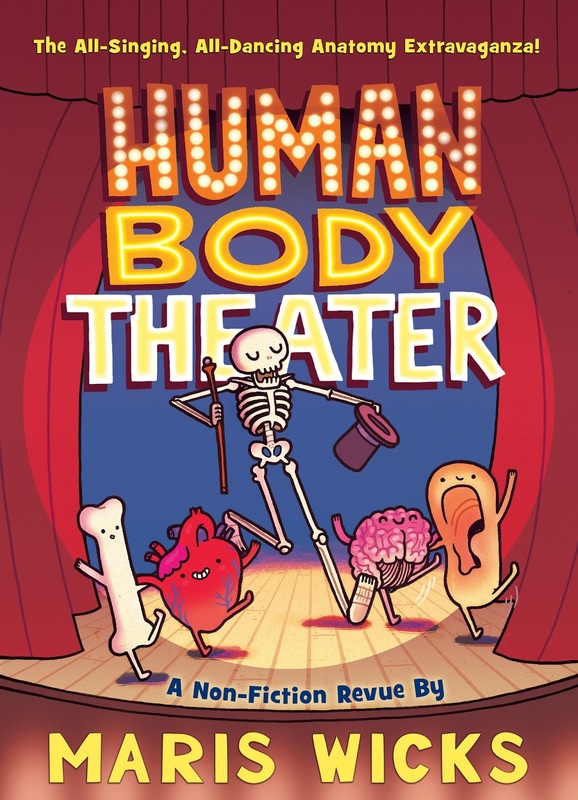 Human Body Theater was published by First Second, and they have much information and a preview available here. Hark! 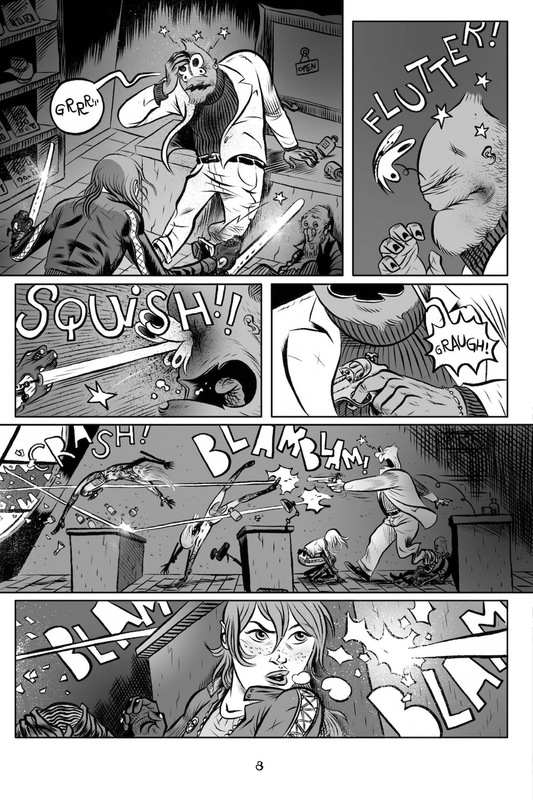 A Vagrant is my favorite webcomic, a random assortment of comic strips about history, literature, philosophical movements, autobiography, and commentary on comics. The artwork is luscious, full of emotive faces, clever dialogue, and smart storytelling. I find myself consistently entertained, surprised, and bemused by the infrequent updates, but I still check in with them whenever I can. 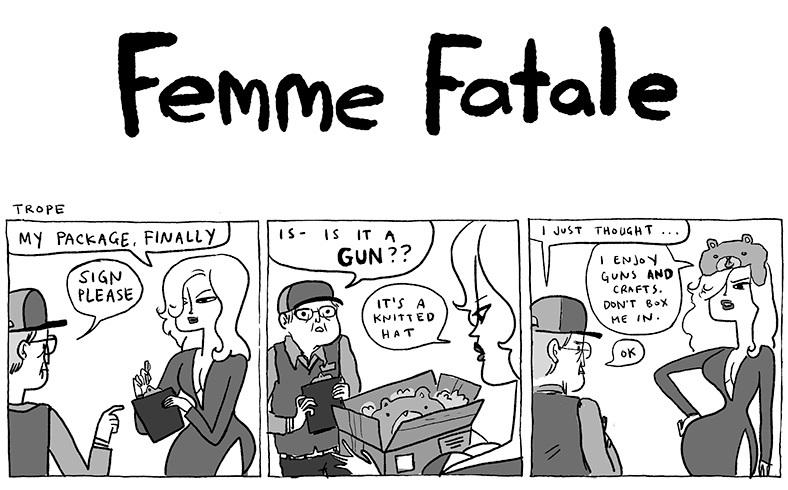 Kate Beaton is a Canadian artist currently living and working in New York. 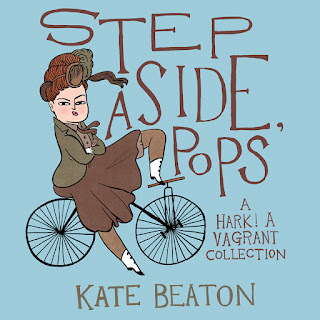 Her work has appeared in numerous anthologies, such as Marvel Comics' Strange Tales and Dark Horse Presents, and even in the prestigious The New Yorker magazine. 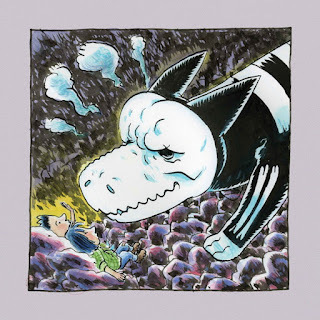 She is one of the most popular and celebrated comics artists working today, amassing quite a list of accolades, including the Doug Wright Award, Ignatz Award, and Harvey Award. She speaks about her work on this latest collection in these two interviews. All of the reviews I have read about this collection have been very celebratory. Writing for NPR, Amal El-Mohtar called it "Sharp, charming, and weird," adding, "I can't recommend it enough." Rachel Cooke wrote that it is "all tremendous fun, eccentric and warm and funny." Tobias Carroll commented that it contained "wonderfully absurd doses of pure comedy" and added that "readers who enjoy smart, irreverent takes on history and literature will find plenty to delight in here." 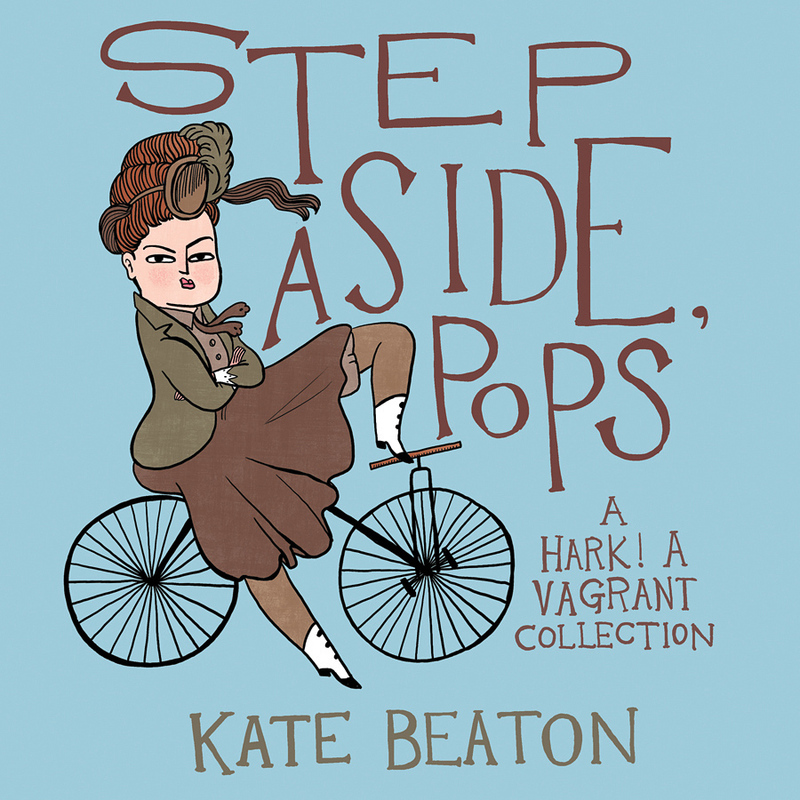 Step Aside, Pops was published by Drawn & Quarterly, and they provide previews and more information here.